TP05 Boston is a set of 210 odd photographs I took during the W3C 2005 Technical Plenary week in Boston. 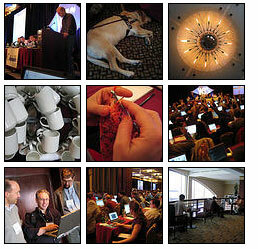 There are also tons of great photos on Flickr tagged with techplen. Finally, I’ve set up a shared pool for favourite photos of the event. A Whatfettle article by Paul Downey published Thursday, March 10th, 2005, at 6:53 pm under a Creative Commons License.